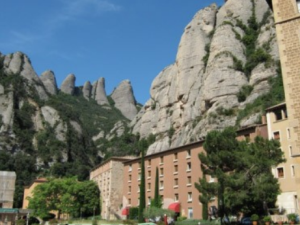 My trip to Montserrat in Barcelona, Spain actually began three months ago when I left the “Keeper of the Hopi Prophecies” Grandfather Martin’s house. I wrote about visiting him during the Return of the Ancestors gathering in the June Spirit of Maat. After the visit I met a most unique woman from Hungary named Kata. She handed me her business card which read Lemurianawakening.com and “Let Your Heart Navigate You”. I was stunned. I’m from Hawaii and like the legends of Lemuria, and believe in heart based living. At the gathering I met people from around the world who are working to improve things. At the gathering Kata was assigned to room with Joyce from New York, and I with Sylvain from Canada. Who would have thought that two months later we would reunite to help Kata with her Lemurian awakening workshop in Barcelona! Grandfather Martin said that there is a possibility of nuclear war or cataclysmic flooding, and to check out and head to the Four Corners — Arizona, New Mexico, Colorado, Nevada, at the first sign of trouble. We’d be safe there. Sylvain checked it out and told me to “go to the Four Corners Monument and walk north and you’ll see the place”. 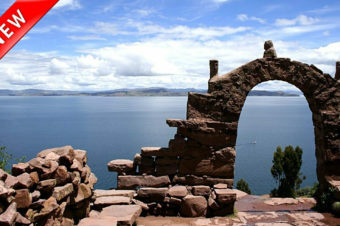 We also heard of other places called the “four corners” near Atlanta Georgia, Bogota Colombia, and Santiago de Compostella in Spain. We have yet to check them out. At site activations I see “tent posts” of light putting up a spherical world wide “webbed tent” which unifies us like a nervous system does to cells. The stronger the nervous system, the better the connection. This “tent” example may not be accurate, but it works for me! So back to the secret recipe. We laughed that our hearts’ dream is to have a wonderful Hungarian goulash dinner in a completely healed Planet and that activating the Lemurian Web of Light is one of the steps to getting there. Finding the secret goulash recipe is another maybe more difficult step. I’m a fan of Drunvalo’s book “Living in the Heart” with included CD meditation. Recently I helped start a group meditation. It’s easy, we sit down, put the CD in and press play. Around 10 of us meet every other week. Years ago scientist discovered a phenomenon where there was a sudden boost in consciousness in monkeys in Japan. After reaching a certain “critical mass”, the monkeys all of a sudden started washing their potatoes. I believe this “100th monkey phenomenon” (pg. 106 of Drunvalo’s Flower of Life) will be the strongest with the Lemurian Web of Light activated and connected to the Grid. And, with enough of us in our hearts to reach this “critical mass”, we will have a boost in consciousness and heal ourselves and Mother Earth. Then we will wash our potatoes and have our Hungarian dinner. To help with Kata’s second Lemurian Reactivation Ceremony, I caught a 17 hour flight to Barcelona from Los Angeles. Kata came in from Hungary and Sylvain from his travels in France. Joyce flew in two days later from Denver. Sylvain was supposed to meet me at the gate, but was delayed, and Kata’s flight details got mixed up. There we were, three people wandering around the Barcelona airport with no idea where the others were. Magically we found each other. After two hours I literally turned around and there was Sylvain. This was the first of many miracles. We set off for Montserrat. As we drove closer and closer this absolutely huge mountain rose out of nowhere thru the sunset. Very very steep and magnificent. It’s a must see. Gentle giants looking like people standing in a row. Here’s a photo. 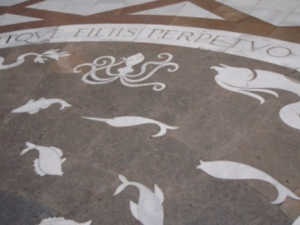 We checked in, walked to the Basilica and saw carved into the courtyard floor many sea creatures and four sacred flames. I thought to myself, now I know why Kata chose this place, these are the sea creatures of Lemuria! Turns out Kata had never seen this floor before and was equally astounded. I felt that the artisans understood the secret beauty of the sea so much that they created this beautiful inlayed floor. Where else can you go in an hour from scenic Mediterranean beaches, to incredible mountains, to a place that honors both? The Basilica bells, which ring the time day and night, woke me at 3am. 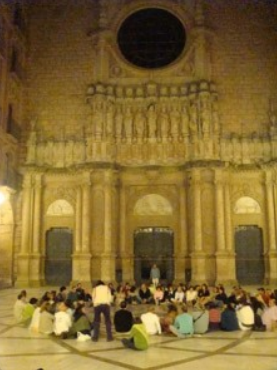 I went into the moderately cool night air back to the Basilica. I found a vantage point to sit where I could see the moon illuminating the valley below, the Basilica, and the gentle giants. I didn’t even need to try to meditate. I like eating breakfast in Catalonia because it’s so festive and unrushed. It’s like we missed each other while sleeping and are so happy to see each other again. After breakfast we toured the interior of the Basilica. It took awhile for my eyes to adjust to the darkness. The beautiful stain glass windows let in light, but it still was very dark. It felt like a peaceful cave and not so “church like”. The rare statue of the Black Madonna watched over us and added to the soft feminine feel of the place. Next we hiked up the mountain past statues of St. Francis of Assisi and Archangel Michael. There were lush green spots where the trees formed a shaded canopy and dry yellow barren rocky spots. The wind blew cool refreshment. I felt my heart beating, my legs climbing, my nose and lungs breathing, my spirit … I felt alive. We touched the huge mountain stones and felt them welcome us. The third day Sylvain and I greeted Joyce at the airport while Kata prepared herself for the workshop. We shopped Barcelona’s quaint streets and bought flowers for the ceremony. We laughed at the sight of us; a bald Canadian, a long haired Asian and a normal looking Joyce carrying a flower bouquet, with one set of luggage in tow. We got back to the hotel and set up the conference room for the workshop. We tested the air conditioning, microphone, lighting, etc. It felt good getting things done ahead of time in a leisurely manner. During the workshop I worked the sound, Sylvain the lights and air, and Joyce sat in the middle and helped coordinate. It was no accident that a pair of roommates from the Return of the Ancestors reunited two months later as roommates and as a team. The work was distributed so we could do our parts as well as relax and actively participate in the workshop. I couldn’t ask for more. The workshop had feminine Kata leading with masculine Carlos translating into Spanish. About 100 people attended with the unique enthusiasm of Spain. There were a few people from South America, the USA, Europe and Russia, with a fair balance of men to women. There was this one family with mom, dad, aunt and a college aged daughter. They all were so lively, playful and affectionate with each other. It seemed so normal, but I can’t remember the last time I’ve seen this. 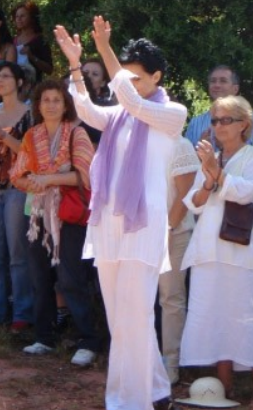 Kata transforms herself from a quiet everyday person to an amazing “Workshop Leader”. A friend who attended Kata’s Teotihuacan, Mexico activation last December said exactly the same thing. 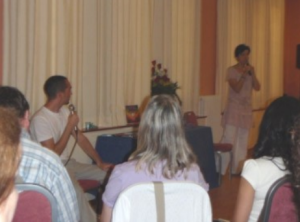 Kata lectured, had us sing songs, led meditations and exercises, channeled and ran the entire workshop. She prepares herself for a full day prior to the channeling, and takes extra care of herself. She channels both the masculine and feminine for short periods of time and integrates the messages into the workshop. 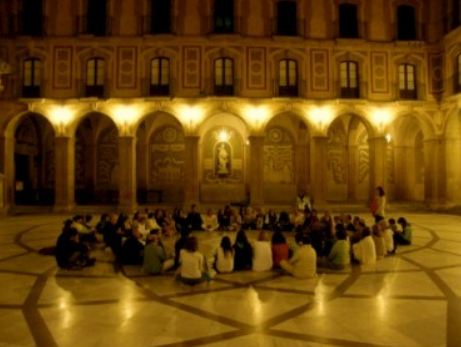 On the first night we gathered in the Basilica courtyard. Some things words cannot describe, so here are photos. Note there’s no roof to this courtyard and you can see the mountain tops when you look up. Evening gatherings have their own special charm. This was an affectionate group. Sometimes they hug for several minutes. After about 30 seconds you kind of just get lost in the hug. Wondering how long is an appropriate hug goes away and you just stand there letting hug communication take over. The men like to really squeeze you. I really squeezed back and we had some really good laughs afterwards. After so many long hugs I felt really healthy. I wished that they wouldn’t smoke cigarettes so much! The next morning we did the “Sufi Dance”. I could tell they really enjoyed it because they were emotional and they took a long time when changing partners. During one of the meditations, our Lemurian Guide was to place a diamond into our hearts. I visualized this for a bit, then I felt someone pushing on my chest. I was startled and I opened my eyes. For a second I saw someone bent over in front of me. I felt their hand pass into my chest. It all happened so fast. Then Kata channeled Kyra Namu. It was the most pleasant voice I have ever heard. Even the silence between words was healing. To a male, the voice of the divine female is . . . well divine. I felt quietly blissful. Her voice cleared the air. The “oh no it’s over feeling” after she finished speaking wasn’t there. Just a supple relaxation and contentment. I told Kata that all I needed to live was to hear Kyra Namu’s voice. After I got home I went to Lemurianawakening.com and read some of Kyra Namu’s messages. I imagined hearing her speak these words. I’ve heard of the divine feminine. This was the first time I experienced it. On the last day we rehearsed the song “Old Lang Syne”. I thought this was rather odd. Kata explained that it is a very ancient song, and when the last cataclysm occurred earlier than predicted, “Old Lang Syne” was sung during the cataclysm to calm everyone. It dawned on me that some had reached safety, but then chose to go back and help. It was so sad. I cried and wrote this poem. Made it to safety high up. On the last day, we hiked to the Chapel of Archangel Michael. I liked that it was a bit strenuous because it added physical fitness to the workshop. As we arrived the musician was playing the Hawaiian version of “Somewhere Over the Rainbow” on a ukulele. It added a nice feeling of the tropics. 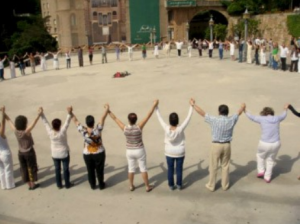 On this summer solstice, just by “accident”, a Flower of Life workshop was also being held at Montserrat. They took a break from their workshop to join us! It added a nice feeling of joint effort. The Divine Feminine created a ceremony that brought us together with all these nice feelings at one of the most spectacular places on Earth. This was a convergence of the many levels of beauty. 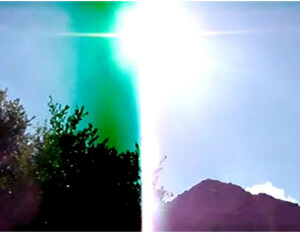 … reactivate completely the healing power of one particular flame, the Emerald Green Healing Light. In the middle of these sacred flames there is one, the emerald green, to be activated fully, to grow in the middle toward the sky, toward the Grid, connecting the heart of the planet with the heart of the Universe . . . See with your own eyes through your heart how this Sacred Emerald Green Healing Flame reach out to the sky and create a huge shining sphere around our planet. We are creating a huge healing sphere… Send your love to the Emerald Flame all day long. www.lemurianawakening.com/Meditation/Meditation.html. After the meditation we sang Old Lang Syne and I filmed it. Little did I know that 1 minute into the video, as I pointed my camera towards the sun, that I would film the following screenshot. To me this is the brightest sign that our work was a magnificent success. Here’s the link to the video. The weather was perfect and the view heavenly. Everything was so surreal. The singing, meditation, ceremony, saying goodbye and hugging for minutes on end all made this so memorable. People slowly began walking down the mountain. Then Kata reached into her bag and pulled out a purple and clear crystal. I read about burying crystals in “The Serpent of Light” by Drunvalo. We were doing what I thought I’d only read about. A charming couple from the area buried the crystal. After they returned I jumped down and ran around and danced through the bushes and trees, most definitely entertaining the nearby animals. Two sites down, more to go. The next activation is Egypt on 11/11/2009. You’re invited! Lemuria is a model, an example of a way of life somewhere over the rainbow. If a Lemurian isn’t in a loving moment, they are navigating towards one. Our hearts are magical and can instantly transform us. Heart happiness and brain happiness are different! We have been hibernating just like how bears hibernate during the winter. We experience four seasons a year and we also experienced a similar four season cycle in the last 26,000 years. 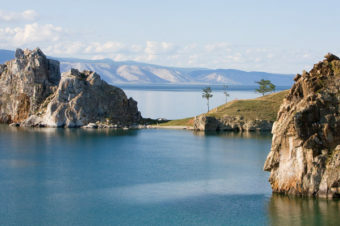 The last Lemurian civilization had the advantage that they had evolved thru Spring and Summer. They were at their height. Today we have the disadvantage that we have been forgetting and hibernating thru a 13,000 year Fall and Winter. It’s Spring! We are now just waking up and remembering. Love and growth comes easier in the Spring. Meditations and exercises today have more results than even just a few years ago. Find a heart meditation you like. Notice your heart in your chest like a sweet lollipop. The next time you look at a menu in a restaurant feel which choice feels the best to your heart/chest area. Try this for other things too! Use all your abilities, including intuition and psychic, to improve your relationships. Healthy relationships heal us. Find that special someone. Having a supportive community around you and a sense of humor helps. Women get out there! You have a keener sense of who you are compatible with than men. Women, really try to help each other out. We all have our own unique charm and the creative ability to surprise each other. Cataclysms don’t matter to beings that have transformed themselves from matter into light. We used to be light beings, we just need to wake up and remember this. Just as rose bulbs are planted, so are crystals. These crystals grow the Lemurian Web of Light and Grid into beautiful flowers of life. Let’s usher in the Spring and cover ourselves and Mother Earth with bouquets of flowers of light. 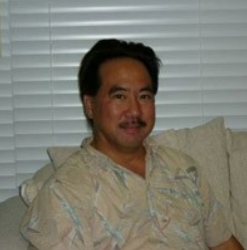 Born and raised in Hawaii, John Nakagawa has a BS in Aerospace Engineering from the University of Southern California. Up until 1995 he worked as a Rocket Trajectory Scientist. His spiritual path opened up in 1993 and he’s been following his heart ever since. A martial artist, musician, and dancer, John can be found at his website; www.lemurianawakening.com or at www.worldviewzmedia.net/profile/John Nakagawa. He can also be reached at jemn80@aol.com, or at 714-878-3710.